A little more than 5 years ago Mike Insler and I had the crazy idea of starting a new racing team in Rochester. Then he up and moved to Maryland 3 years ago, leaving me short a training partner and a chief rival. 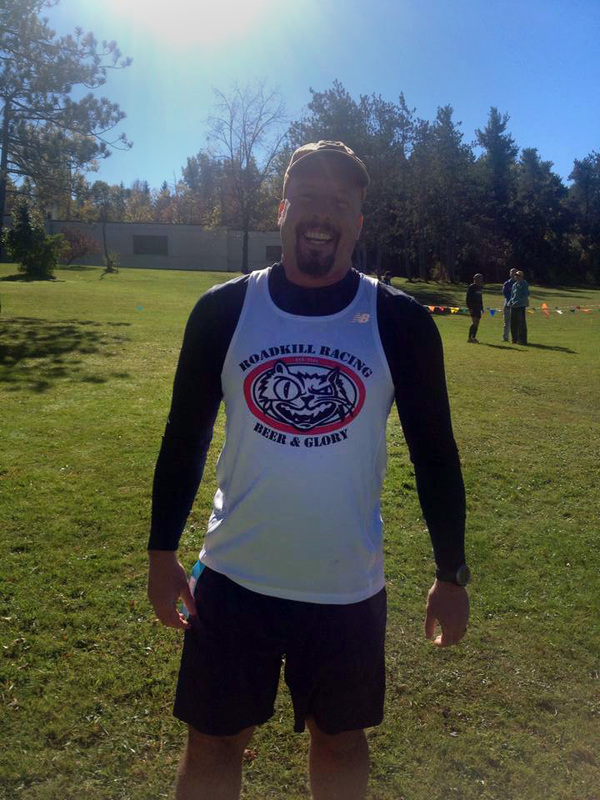 This past weekend Mike returned for a visit and I knew we had to find a race to do together. Roadkill Racing came out in force and showed Mike how much the team has grown over the years. We had some great performance by our open runners, and also from our new masters women runners. 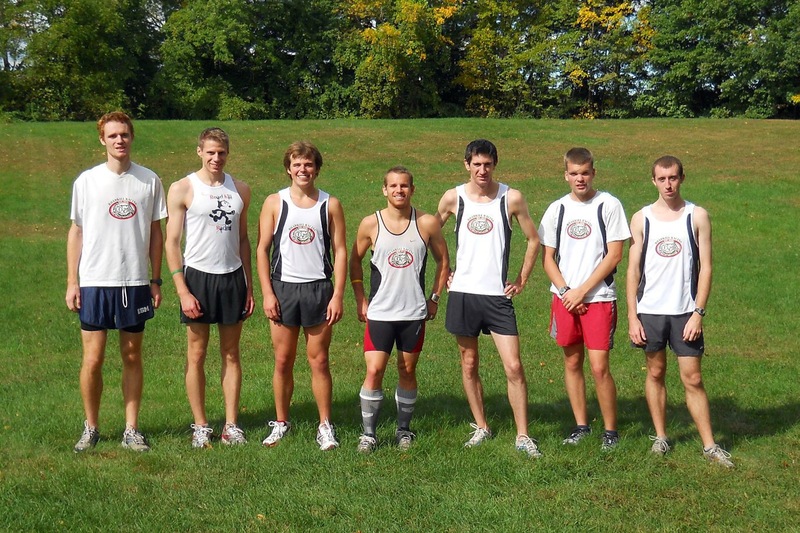 We have come a long way from that first meet in 2010 and our iron-on singlets. Once again it was Kenny Goodfellow leading the way. 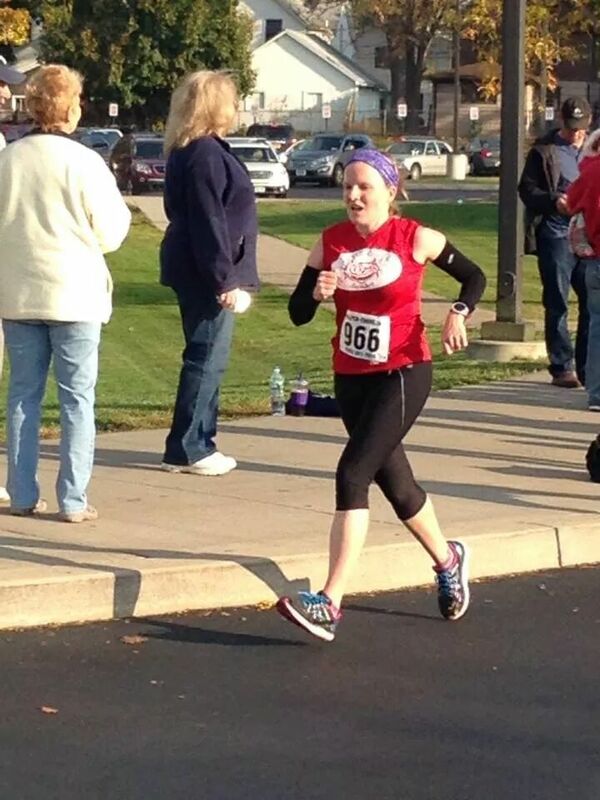 This time at the Scare Brain Cancer Away 5k in East Rochester. We had 11 runners compete in the race with lots of overall and age group awards won and even a few PR’s. 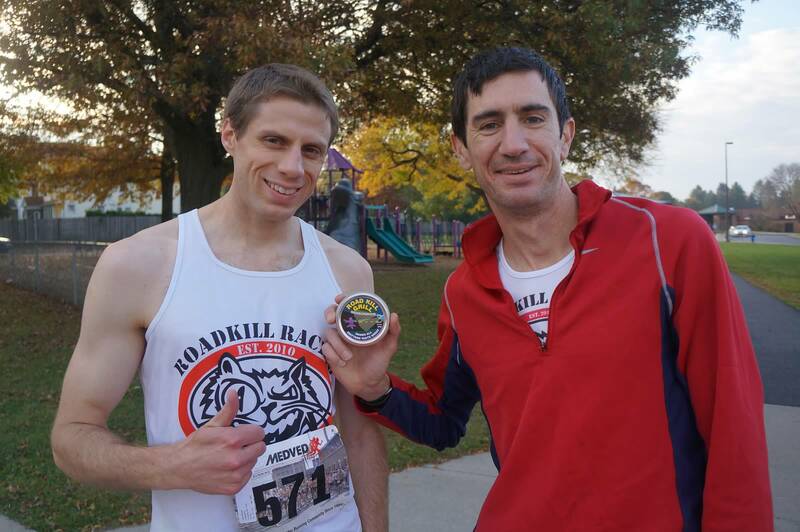 Kenny (16:13) finished 2nd overall with Matt Roberts just 3 seconds behind in 16:16. I took top masters honors in 4th overall with a 16:20. 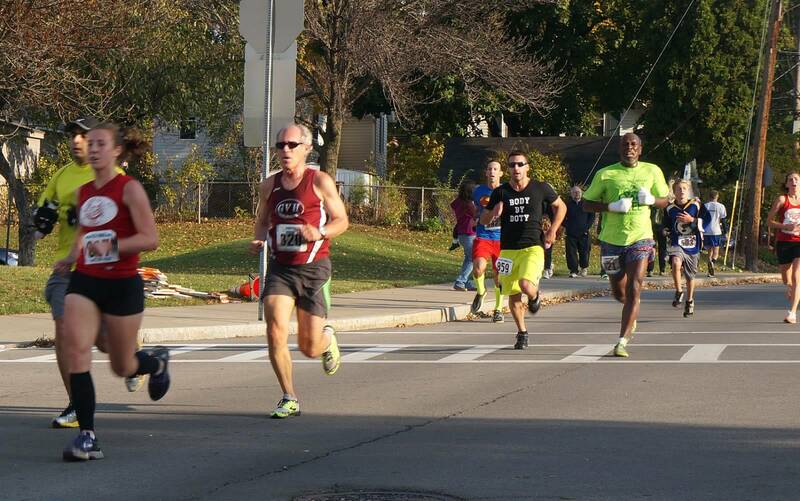 Derrick Jones (16:38) and Mike Insler (16:43) gave us 5 runners inside the top 10 both winning their age group. 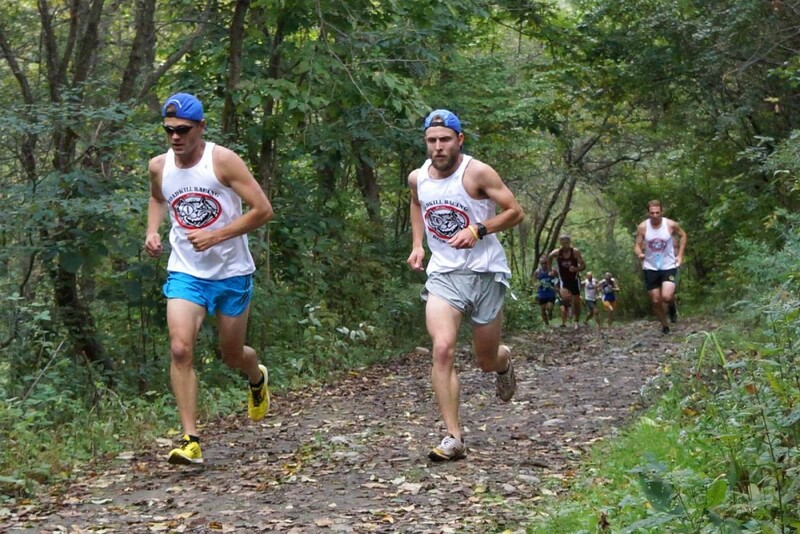 Rounding out the men’s team were Andy Penner (17:13) Josh Williams (17:14) and Joe Williams (18:20). The race was Josh’s fastest 5k by over 20 seconds and just a few seconds off Joe’s best. Andy’s 11th place overall was good for 1st in his age group. Not to be outdone by the men, the women’s team turned in some impressive performances as well. All 3 ladies ran PR’s (1 lifetime and 2 post pregnancy). Ashlie Roberts who is gearing up for the Indy Monumental Marathon next weekend lead the way in 21:18 ( LTPR) followed closely by Lisa Perks in 21:20 (PPPR). The picture above shows Ashlie and Lisa separated a healthy margin with 100 meters to go, Lisa threw down a serious kick to close within 2 seconds! Lynn Gottfried, who managed the awesome feat of running her final mile of this race faster than her McMullen Mile time in June, finished in 23:15 (PPPR). While Mike was up here Adam was down in DC racing in the 28th Annual Walk to End HIV 5k. He finished in 3rd place with shiny new 23 second PR of 16:09! That made for 3 20+ second PR’s in one weekend… I think there is something to this team racing thing. 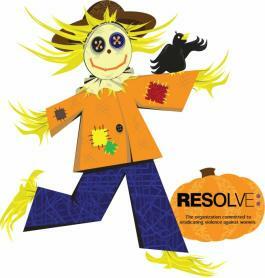 One final note on the Scare Brain Cancer Away race. Take a look at the picture below taken right before the start. This is after Derrick told the starter something should be said. The starter (director?) at Derricks urging said “If you aren’t planning on running a 5 minute mile you shouldn’t be on the front line.” This caused a bit of laughing from the 1000 runners but no change. He went ahead and started the race anyway. I didn’t think this was funny in the least. It is dangerous. I’m sure that many of the people a few rows back had no idea there were a bunch of young kids, some literally coming up only to my waist, on the line. 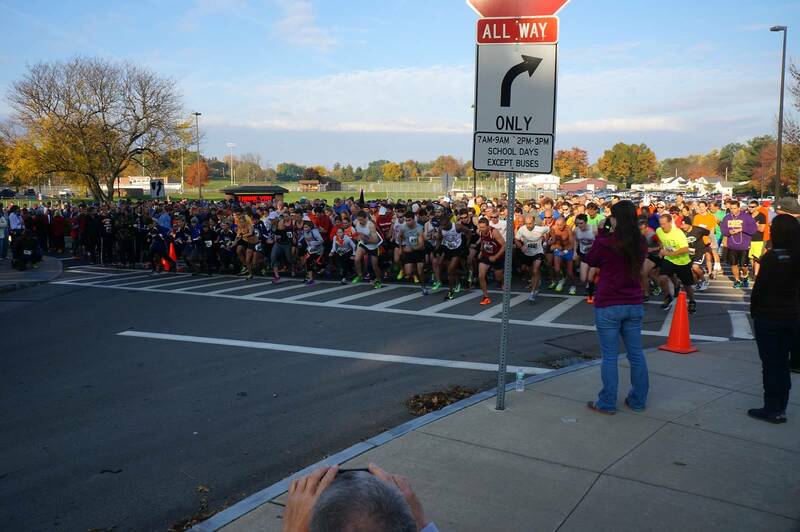 I would strongly encourage race directors to take a more active role in managing runners at the start, especially in a race with this many people. 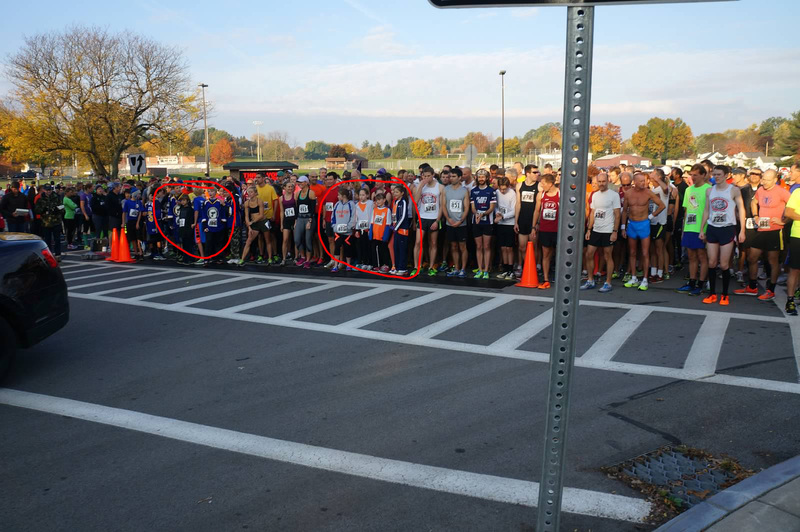 I would also strongly encourage whoever was responsible for these kids (they appeared to be a boys hockey team and a girls soccer team) to understanding racing protocol before taking kids to a race. 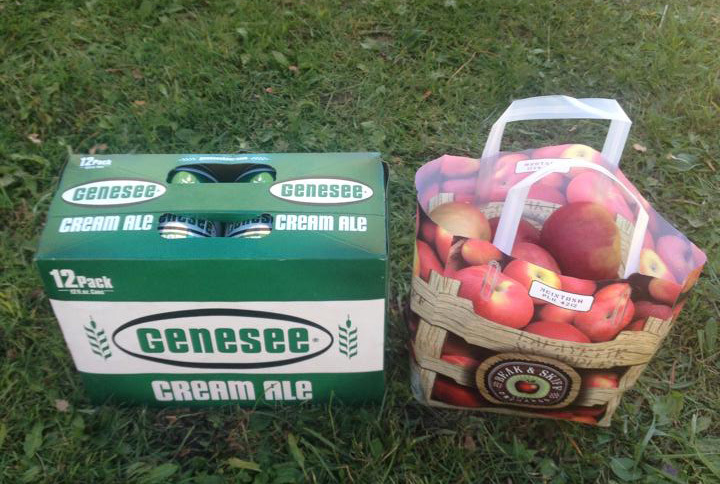 A huge thanks to everyone who contributed photos to this post including the Rochester Photo Crew and Roadkiller Lauryn. 3 Years ago Roadkill Racing won the Pete Glavin XC Series taking 3 of the 5 races including the Championship race. Since then it has been rough going. We were shutout in 2012 and in 2013 we didn’t even have enough runners to field a team. But it has been a busy year and we returned to form at the first race of the 2014 season. Just look at those faces. Do those look like the faces of runners who are messing around? OK maybe Kenny is messing around but Matt is serious as hell. 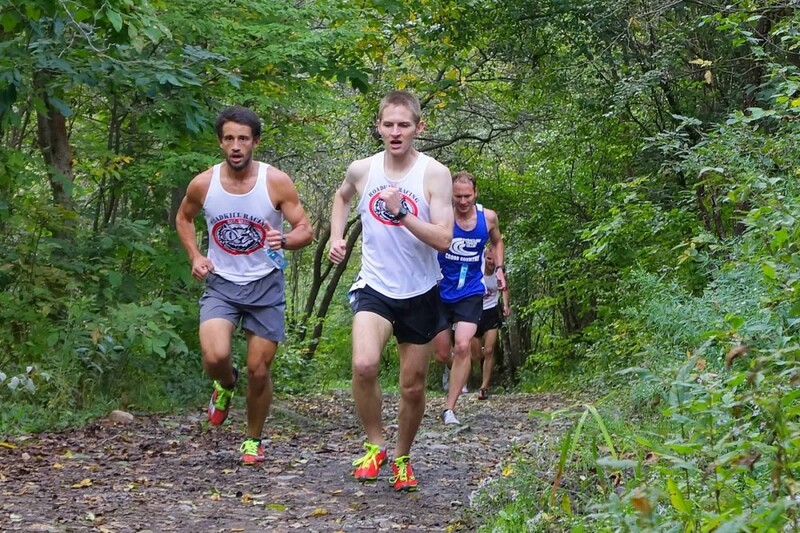 Seventeen Roadkill Racers competed in the opening race of the PGXC Series Sunday at Jamesville Beach. 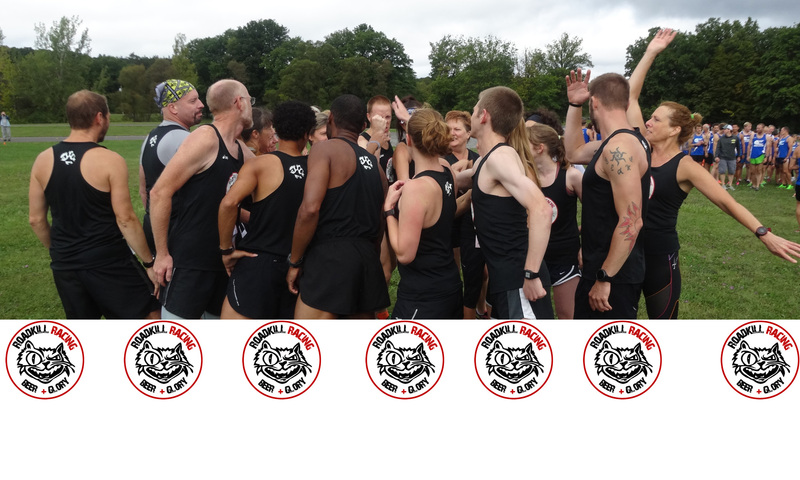 Seven open men, 5 masters men and 5 open women took on the challenging 5k course along with 140 other runners. It was the first time we had fielded a women’s or masters team. Leading the way for Roadkill were a couple of old hands, Kenny and Pete but we had a number of runners making not only their cross country debut but also their Roadkill debut. Josh Williams, Joe Haungs, Kraig Connor and Megan Ganskop ran their first of what will hopefully be many races for Roadkill Racing. 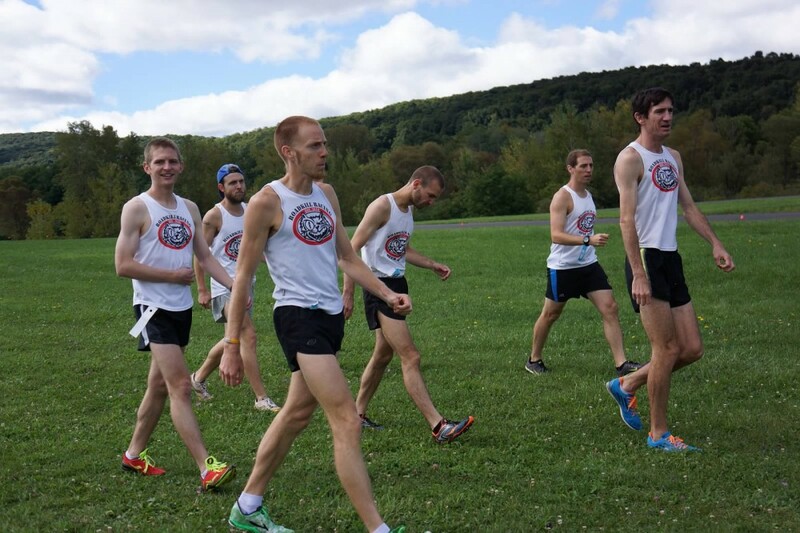 The open men finished 3rd and the open women finished 4th against stacked fields of Syracuse Track Club, Genesee Valley Harriers, Checkers Athletic Club, Cornell Running Club and High Noon. The masters men owned the day though, surprising the series old timers and taking home Beer & Glory! One of our runners got a little too excited (Derrick) and dropped his beer. I am confident that we will be able to win another one for him before the end of the series.